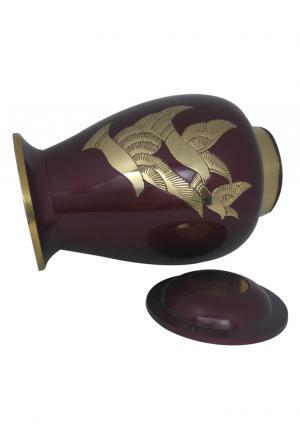 Flying Golden Dove Adult Cremation Urn for Ashes is Solid brass made large adult urn to preserve ashes. 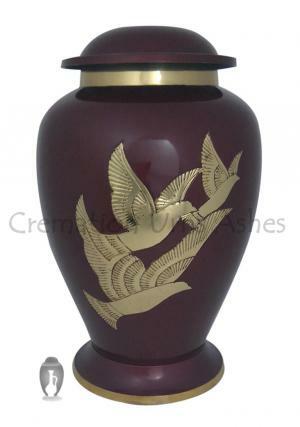 The Adult urn is decorated in Dark Maroon with printed flying dove in gold. 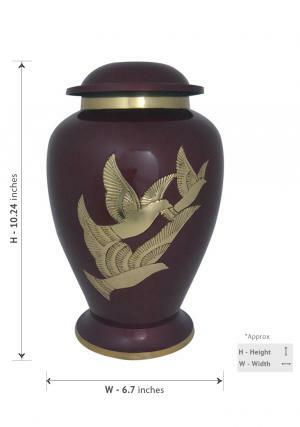 The large urn decorated in Maroon and Gold represent the artisan work of skilled professionals with simple idea of bring flying dove on the urn. The Large unique memorial urn with gold decoration at the neck of the urn which has a specialised threading on the top of the urn with screw threading to the lid, help lock the top of the urn and secure the ashes of the loved one. 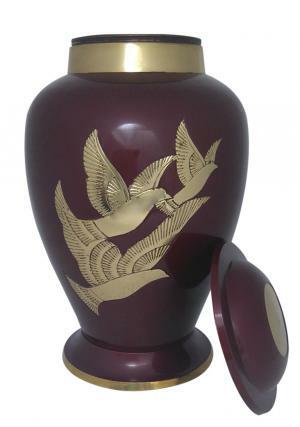 The dimensions are specialized to carry adult ashes of the funeralized with a copper finish. The Adult urn is measured with height of 10.24 inches, width of 6.7 inches and weighs 2.31 kg (empty) and can hold 200 cubic human ashes to an approximation.